Fantastic INVESTMENT PROPERTY! Great Rental history (will provide upon request). 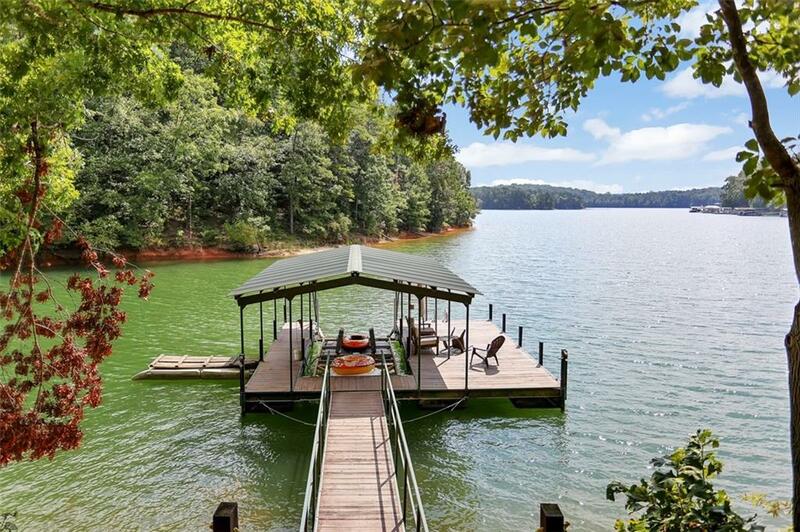 Located in an upscale gated subdivision within minutes of I-85, this Lake Hartwell waterfront chalet is the coveted combination of rustic charm and luxurious upgrades. Whether you're seeking a waterfront retreat for vacations, or a permanent place to call home, 114 Gates Cove Drive is well suited for either scenario. Vaulted pine ceilings, a stone wood burning fireplace, and a wall of windows looking toward the lake are the main highlights of the great room. The open deck on the main level is an excellent place to enjoy the views. The kitchen has been recently updated with a fresh coat of paint and new hardware on the KraftMaid cabinets, along with beautiful quartz countertops, white subway tile backsplash, and all new stainless steel Frigidaire Gallery appliances. A raised breakfast bar provides informal seating for meals, and the dining room can accommodate large groups for those who enjoy entertaining. The main level guest bathroom has been completely updated and includes quartz countertops on the vanity and a walk-in ceramic tile shower with pebble tile floor and frameless glass door. Two of the four bedrooms are located on the main floor. Upstairs, the master suite features the same vaulted pine ceilings found in the great room, as well as a stone wood burning fireplace, sitting area, and large walk-in closet. The master bathroom has been fully renovated and includes a custom tile shower with frameless glass door, fully restored claw foot tub (circa 1910), Restoration Hardware mirrors, lighting, and accessories. The finished terrace level has also received a big upgrade - wood grain ceramic tile throughout both rec room areas, hallway, and in the bathroom. A third wood burning fireplace can be found on this level, along with the home's fourth bedroom, a flex space (could be sleeping quarters, office, exercise room, etc. ), walk-in laundry room, and a large unfinished area. Through the glass doors, you'll walk onto a covered deck, which leads to a fully screened area on the side where the hot tub is located. A gentle slope leads down to the covered dock in a quiet, deep water cove. Get ready to start enjoying paradise!